Comments: Oldsmobile was the first to respond to Pontiac’s GTO by taking the best engine they had, a 330 cid V8 modified with all available police issue equipment including a dual-snorkel air cleaner and premium quality rod and main bearings. The package included a 4 barrel carburetor, 4 speed manual transmission, and dual exhausts, which gave it the name of 4-4-2. The package also included heavy-duty shocks, springs, and a rear stabilizer bar. 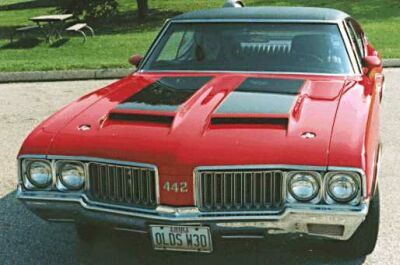 The 4-4-2 package was technically available on all Oldsmobile midsize cars, including the cheaper F-85 and more luxurious Cutlass, except station wagons (it was therefore possible to have a four door 4-4-2). Due to a late introduction and a confusing promotion campaign, only 2,999 4-4-2’s were sold in 1964. This would soon change. 330 V8 310bhp @ 5200 rpm, 355 lb-ft @ 3600 rpm. 330/310: 0-60 in 7.4 sec, 1/4 mile in 15.6 sec @ 89 mph. Comments: Oldsmobile finally got the 4-4-2 package right for 1965. They eliminated four door models and made it optional on all two door F-85s and Cutlass models. The previous engine was replaced with a new 400 cid engine, generating 345bhp and 440lb-ft. The name now signified the 400 cid engine, 4 barrel carb, and dual exhausts. The package included heavy duty issue shock absorbers and springs, battery, clutch, front and rear stabilizer bars, fat tires, and 4-4-2 badges. Marketing was much more youthful and organized, and sales improved to 25,003. Critics pronounced the 4-4-2 as one of the best handling of the intermediate muscle cars and an all around balanced performer. 400 V8 345 bhp @ 4800 rpm, 440 lb-ft @ 3200 rpm. 400/345: 0-60 in 5.5 sec, 1/4 mile in 15.0 sec @ 98 mph. Comments: 1966 saw new sheet metal for the Oldsmobile midsize line, and a new option under the hood. The F-85 and Cutlass models had a pronounced hump over the rear windows and large C-pillars that extended beyond the rear windshield. The base engine was tuned to generate an extra 5 bhp, but the big news was the introduction of Oldsmobile’s first tri-carb option since the late 1950s. This boosted output to 360 bhp and the transition between the carbs was smooth. A long list of options were available including five transmissions and eight axle ratios. Handling remained top-notch due to suspension upgrades and critics again proclaimed the 4-4-2 as the most balanced muscle car. Oldsmobile also quietly made available a new performance option only for the triple carb engine that consisted of an air-induction system, front bumper openings and internal engine modifications. The option was known as W-30. 400 V8 350 bhp @ 5000 rpm, 440 lb-ft @ 3600 rpm. (3×2 bbl) 400 V8 360 bhp @ 5000 rpm, 440 lb-ft @ 3600 rpm. 400/350: 0-60 in 7.1 sec, 1/4 mile in 15.5 sec @ 91 mph. Comments: No sooner had Oldsmobile released its tri-carb setup, GM banned such setups for all of its divisions. Undaunted, Oldsmobile introduced two new engine options for its 4-4-2. The first was option L66, the “Turnpike Cruising package” which included a detuned 400 cid engine with a two barrel carb. Of greater interest to enthusiasts was the return of the W-30 package. This “forced air induction system” included special air ducts, fan shroud, camshaft, heavy duty springs, and chrome valve covers and an air induction air cleaner that had huge hoses connecting it to special air induction slots above and below the parking lights. The 4-4-2 package was now only available on the higher price Cutlass models, which combined comfort and performance. (L66) 400 V8 300 bhp @ 4600 rpm, 425 lb-ft @ 2600 bhp. (W-30) 400 V8 360 bhp @ 5000 rpm, 440lb-ft @ 3600 rpm. (W-30) 400/360: 0-60 in 6.7 sec, 1/4 mile in 14.98 sec @ 95mph. Comments: 1968 would prove to be a dramatic year for the 4-4-2. For the first time, the 4-4-2 became its own model, still based on the Oldsmobile A-body midsize platform. 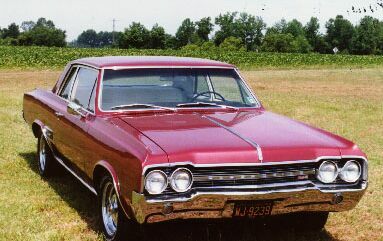 For 1968, all GM A-body two doors lost three inches of wheelbase and gained shapely new sheet-metal. Although both the standard and Force Air induction engines sported an increased stroke and decreased bore (the opposite of general practice), their displacement and power ratings remained the same. The Force Air engine now had air intakes positioned under the bumpers while the Turnpike Cruiser engine was detuned slightly. The big news for enthusiasts was the introduction of the Hurst/Olds. The prototype had been designed as a one-off by Jack “Doc” Watson for his boss George Hurst, the designer of the Jaws of Life and the most respected name in transmissions. Watson took a 4-4-2 and dropped in the 455 cid V8 from the Oldsmobile Toronado. Encouraged by the success of the transplant, Jack Watson was able to convince Oldsmobile executives to authorize a limited run of Hurst/Olds. All Hurst/Olds featured Force Air systems and Turbo Hydromatics with Hurst Dual-Gate shifters and came in only one color combination, Peruvian Silver with Black accent stripes and rear-deck panel. Only 515 were produced for 1968, and they are highly prized today. (L66) 400 V8 290 bhp @ 4600 rpm, 425 lb-ft @ 2600 bhp. (Hurst/Olds) 455 V8 390 bhp @ 5000rpm, 500 lb-ft @ 3200 rpm. (Hurst/Olds) 455/390: 0-60 in 5.4 sec, 1/4 mile in 13.9 sec @ 103 mph. Comments: 1969 saw the introduction of several “W” options on the 4-4-2 which sported a new grill design. The W-30 option returned with its Force Air induction, and below bumper intakes. A new W32 option replaced the “Turnpike Cruiser” option and incorporated a detuned Force Air induction engine. This was joined by the W-31, which was available on several F-85 and Cutlass models. This package incorporated a 350 cid small block with a special carb, valves, and camshaft. The Hurst/Olds returned, with a new regal gold and white color scheme, outrageous hood scopes and the 455 cid V8 that was detuned slightly from 1968. (W-31) 350 V8 325 bhp @ 5600 rpm, 360 lb-ft @ 3600 bhp. (W-32) 400 V8 350 bhp @ 4800 rpm, 440 lb-ft @ 3200 rpm. (W-30) 400 V8 360 bhp @ 5400 rpm, 440lb-ft @ 3600 rpm. (Hurst/Olds) 455 V8 380 bhp @ 5000rpm, 500 lb-ft @ 3200 rpm. (Hurst/Olds) 455/380: 0-60 in 5.9 sec, 1/4 mile in 14.03 sec @ 101 mph. Comments: 1970 saw the lifting of GM’s ban on engines greater than 400 cid installed in midsize cars. 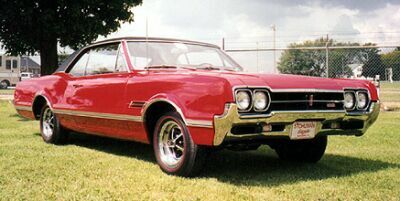 Although Oldsmobile had gotten around that rule in 1968 and 1969 through the Hurst/Olds, this now enabled Oldsmobile to offer its 455 cid V8 in all 4-4-2s. 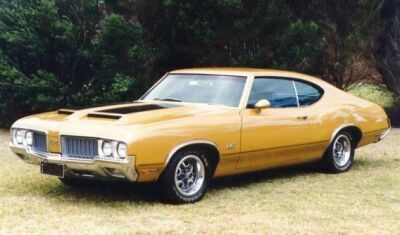 The Hurst/Olds was dropped from the lineup and wouldn’t reappear until 1972. The W-30 hit its performance peak and included a balanced and blueprinted 455 V8 with a hotter cam, performance carb, low-restriction exhausts and the Force Air induction system which utilized two prominent scoops on the hood. The W-30 package also included a lightweight fiberglass hood, plastic inner fenders, aluminum differential carrier and cover, and less sound insulation in an attempt to cut weight and improve performance. 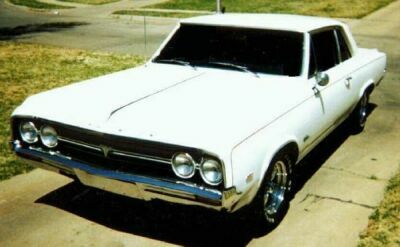 The W-30 option was offered only on Cutlass models, but a new option, the Rallye 350, was offered. Powered by a 350 cid engine, the smallest displacement Oldsmobile muscle car sported the most outrageous exterior, which was only painted in a very bright yellow. Even the bumpers and wheels were painted yellow. This would be only a one year option as the performance market would collapse after 1970. (Rallye 350) 350 V8 310 bhp @ 4200rpm, 490 lb-ft @ 2400 rpm. 455 V8 365 bhp @ 5000 rpm, 500 lb-ft @ 3200 rpm. (W-30) 455 V8 370 bhp @ 5200 rpm, 500 lb-ft @ 3600 rpm. (W-30) 455/370: 0-60 in 5.7 sec, 1/4 mile in 14.2 sec @ 100mph. Comments: 1971 saw the beginning of the end for all muscle cars, and the 4-4-2 was no exception. To comply with a GM decree that all engines must be able to run on unleaded fuel, all engines saw a drop in compression and a corresponding drop in power ratings. This was further compounded by the move to rate engines with all accessories attached (the “net rating”) which lead to some drastic changes over the previous “gross” ratings. The standard 455 dropped to 270bhp net (340bhp gross) while the W-30 dropped to 300bhp net (350bhp gross). The W-31 and Rallye 350 were dropped, and the Hurst/Olds was still unavailable, but the W-30 was still available for the enthusiasts, and sported the familiar Force Air induction system and the 1970 hotter cam. 455 V8 270 bhp @ 4600 rpm, 370 lb-ft @ 3200 rpm. (W-30) 455 V8 300 bhp @ 4700 rpm, 410 lb-ft @ 3200 rpm. (W-30) 455/300: 0-60 in 6.5 sec, 1/4 mile in 14.8 sec @ 98 mph. 350 V8 160 bhp @ 4000 rpm, 275 lb-ft @ 2400 rpm. 350 V8 180 bhp @ 4000 rpm, 275 lb-ft @ 2800 rpm. 455 V8 250 bhp @ 4200 rpm, 370 lb-ft @ 2800 rpm. (Hurst/Olds) 455 V8 300 bhp @ 4700 rpm, 370 lb-ft @ 2800 rpm. 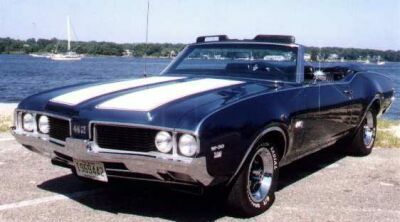 Comments: 1973 saw a drastic change to the shape of the Cutlass as it gained all new sheet-metal and a new euro look. The 4-4-2 package was now labeled as the W-29 option and was only available on the Cutlass and Cutlass S coupes. The package included the same handling and appearance items as the year before. The W-30 option was dropped from from the lineup leaving only the Hurst/Olds to carry the performance banner. The Hurst/Olds came in Cameo White or Ebony Black with gold stripes and a white vinyl roof. But the fancy trim couldn’t hide the loss of 50bhp as the 455 was further detuned to meet increasingly tough emission standards. Hurst/Olds models would be built in 1974, 1975, 1979, 1983, and 1984. But none of the successors could match the power of the originals. 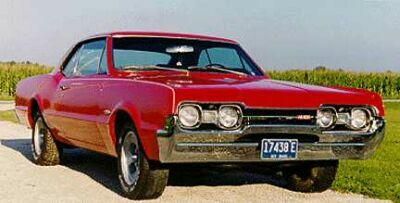 Oldsmobile withdrew from the performance market after 1973, and although the 4-4-2 name would later resurface on numerous models in the next two decades, none of them could match the sheer brute strength of the true muscle car models of the sixties and early seventies. 350 V8 180 bhp @ 3800 rpm, 275 lb-ft @ 2800 rpm. 455 V8 250 bhp @ 4000 rpm, 370 lb-ft @ 2100 rpm. (Hurst/Olds) 455 V8 250 bhp @ 4000 rpm, 370 lb-ft @ 2100 rpm.